Welcome to beautiful Maui and our inviting condominium at Maui Parkshore! From the lanai on the top floor of this well-located resort, your eyes will feast on the tropical, beautiful surroundings just two minutes from south Kihei’s favorite beach park, Kamaole III. Jump into your swimsuit, grab a boogie board and beach chair, and in minutes your toes will tickle in the warm sand leading to the incoming waves. This ideal location offers many benefits for your vacation. Numerous restaurants with varying cuisines are nearby. The elegant Wailea Shops just down the road are nestled among high-end resorts and beautifully landscaped properties. Options to enjoy snorkeling, diving, kayaking, fishing trips and whale watching excursions (during the winter months) are available. Our own lovely grounds have 4 professional-grade gas BBQs next to a covered patio with picnic tables. The shuffleboard court nearby is much used. The lovely swimming pool with lounge chairs and tables is a favorite for all ages. The grocery-type carts in the corner of the building will easily transport your luggage via the elevator to our condo on the 4th floor. A reserved parking spot is waiting for you in our guest-only, well-lighted parking lot. When the afternoon sun reaches the condo, we greatly enjoy the cooling effect of our lanai screen. As the sun begins to set, the awesome, breathtaking sunsets preclude the perfect end to a perfect day. KITCHEN: Recently-renovated kitchen provides ample dishes, silverware, baking and cooking utensils, as well as basic food preparation supplies -- spices, seasonings, etc. Large appliances include electric range, microwave, dishwasher and refrigerator. Small appliances include a Keurig, 12-cup coffee-maker, 4-slice toaster, blender, waffle-maker, 2 rice cookers (large and small), crockpot, and small mixer. The glass-topped round table can accommodate 6 people, and the armed-chairs with castors are most comfortable. LIVING ROOM: The all-bamboo furniture lend an island-feel to this room. Two reclining chairs and the sofa-bed couch make it easy to relax and enjoy the flat screen TV in the entertainment center. You’ll find a good supply of books to read when you want to relax. MASTER BEDROOM: The comfortable, queen-sized bed is flanked by bed stands and lamps on either side. A large dresser with mirror, an extra-bedding trunk, and a table with a TV complete the furniture here. The master bath features a large, step-in tile shower. GUEST BEDROOM: The twin beds have a good-sized table between with a lamp on top. A 4-drawer dresser with mirror is next to the corner chair. This large closet houses the beach chairs, boogie boards, and other beach supplies/equipment. Beach towels are provided in the hall linen-closet. You’ll find several family games above the linen closet. King-sized bedding is available iin the linen closet should you want to turn the twin beds into a king. MAIN BATH: This bath features an enclosed tub/shower. Extra bath towels are available in the hall linen closet. The pounding waves from time to time will assure you the beach is just across our parking lot/the street/and the narrow park. Relaxing on the spacious lanai, you see fishing boats, canoes, etc. 2 recliners, sofa, end tables with lamps, coffee table, entertainment center with TV and books to read. Nice round table with 4 castor chairs. Two shelves or reading material in entertainment center. Several games and puzzles in cupboard above hallway linen closet. Guest room closet offers beach toys and equipment. Thank you so much, glad you enjoyed your stay. Location was excellent, Condo had everything we needed! Being right across the street from Kamaole III and with uninterrupted ocean views for sunsets this condo was worth the great price for that alone! Condo had all the beach stuff we needed and plenty of room for 6 of us. Patio was an amazing size and spent most of our time at the condo out there. Nothing special to say regarding the rooms or bathrooms but it was functional, well maintained, and clean! Thank you for your comments. 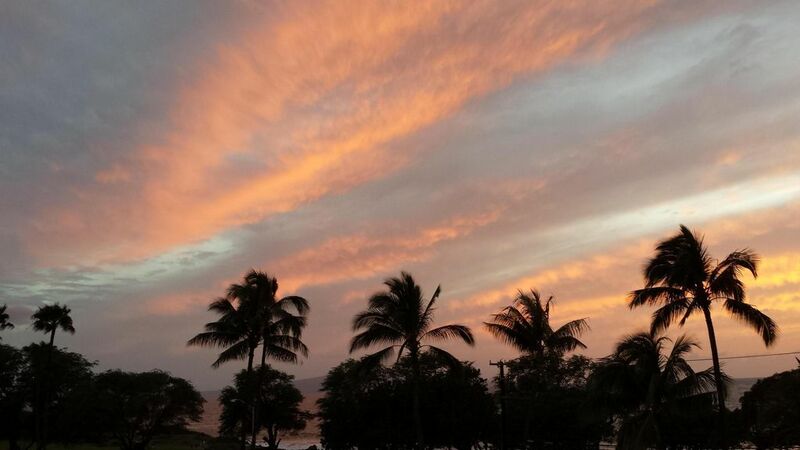 Like you mentioned, we never tire of the beautiful sunsets enjoyed from our lanai! We’re glad the location and amenities worked well for your group. Ocean views and everything you need! Perfect location in Kihei, directly across from the beach where we swam and snorkeled and chilled. There were plenty of shopping, restaurants and activities to enjoy within walking distance or a quick Uber. We rented scooters one day from Kihei Moped Company (recommend), snorkel gear at Bob's (get the full face mask! Also, mile marker 14 shore on left on the way to Lahaina was just right to snorkel on your own instead of paying for a trip-lots of fish and some turtles big and small - bring a picnic), ate at many of the local, walk-able eateries, the kids love the Escape Room and went many times. There was just so much to do! If you do the Road to Hana, you must get the $8 app on your phone and you can't miss the black sand beach! The condo was just perfect! Two bedroom/two bath made it very helpful with 2 adults and 2 kids plus and additional pull out bed if needed. Plenty of room to where you're not bumping into each other. It came with a lot of amenities which saved on purchasing yourself and the left overs from past guests provided the rest. There was plenty of TP, cleaning supplies, shampoo, soap, dish and laundry soap, first aid, sunscreen, condiments, sugar, so much. The kitchen has everything you could need! Dishes, cups, coffee makers, pots, pans, bowls, everything. We cooked on the stove one night, used the BBQ's outside another and we didn't need for anything. Living room was comfortable with basic TV and the kitchen and living room both over look the beautiful ocean. The lanai itself is another room all together, we enjoyed eating out there watching the people come and go and the amazing sunsets every night. They have a large blind for when the sun gets too hot. Although there is no AC, leave the front and back doors open and the breeze is wonderful and comes into the bedroom windows at night. There are also ceiling fans and floor fans that give you that extra airflow. The fourth floor was great as we could see the ocean for miles with the green trees and colorful flowers all around was so relaxing. We met many great people and felt like we had a home away from home for a week. It was better than any hotel could ever be with a full kitchen and laundry right there. The closets held beach towels, towels, sheets, boogie boards, chairs, ice chest, swim noodles (which I used with snorkeling), board games. Will recommend this Home to anyone and everyone who is looking for a great place to stay! Great location on the 4th floor facing the beach. The condo is fully stocked and also has everything you will need for a day at the beach (towels, boogie boards, chairs, etc.). No air-conditioning, but there were several fans in the condo. If you sleep with the lanai door open, you can hear the waves crashing on the beach, which is very soothing. We had a broken closet door and the owner was very responsive and got it fixed quickly. Our family had a wonderful time. Thank you, Brenda, for choosing our condo for your Maui vacation, and for your positive comments regarding your stay. We appreciate it! Great value for a fantastic location! My husband and I stayed with our 18 and 21 year old daughters, so we really appreciated having the second bathroom and second bedroom with twin beds. The condo is spacious with a large lanai facing the ocean. We used the bbq area and ate dinner on the lanai a couple times and really enjoyed it. Kamaole beach park III is right across the street - super handy and great for snorkeling. The waves were too mild for boogie boarding while we were there. Kitchen is well equipped and there are lots of towels and beach toys. We would definitely stay again. Thank you for your kind response. We’d be honored to have you stay again. Wanted to take this condo and its location home with me! We stayed in this little home away from home from Dec. 7-Dec. 15. We absolutely loved the location-- right across the street from Kamaole Beach III and not far from restaurants or access to Piilani Highway. We were on the 4th floor and had an amazing view of the ocean and sunsets from the lanai. We really liked the convenience of having a designated parking spot just outside. Another feature that I really liked was that there was a keypad instead of a key! How many times have you gone to the beach and stressed about losing a key? The condo was very well equipped with everything we needed.... coffeemaker, toaster, Keurig, blender, condiments, beach towels, beach chairs, boogie boards, games, cooler. It is the total package! We have stayed in 3 other places in previous trips, and would choose this one again! Thank you very much ! We love the condo Too. Cancellation Policy : If canceled 90 days before arrival no charge, between 60 and 45 days $25.00 charge, canceled less than 45 days no refund unless re rented.